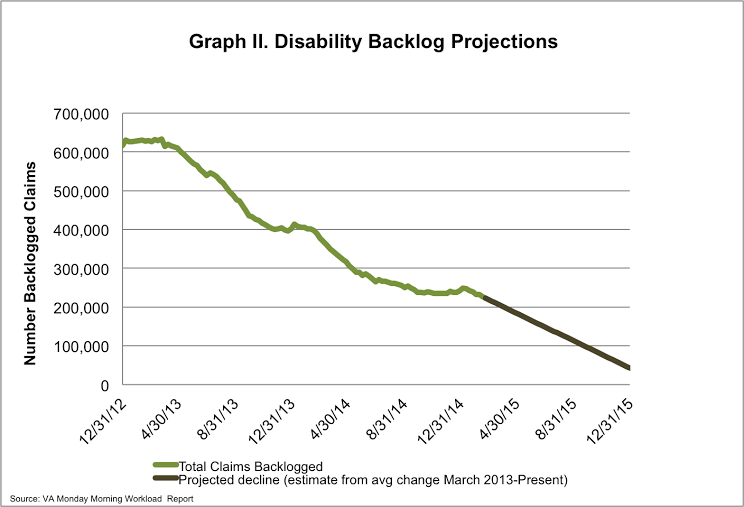 On Monday, the VA reported the disability compensation claims backlog decreased by 4,000 claims for the week of February 15-21, 2015. The total number of pending claims decreased by nearly 4,000 claims as well. As of February 21st, over 484,000 disability compensation claims are pending a decision at the VA, with over 222,000 claims backlogged. 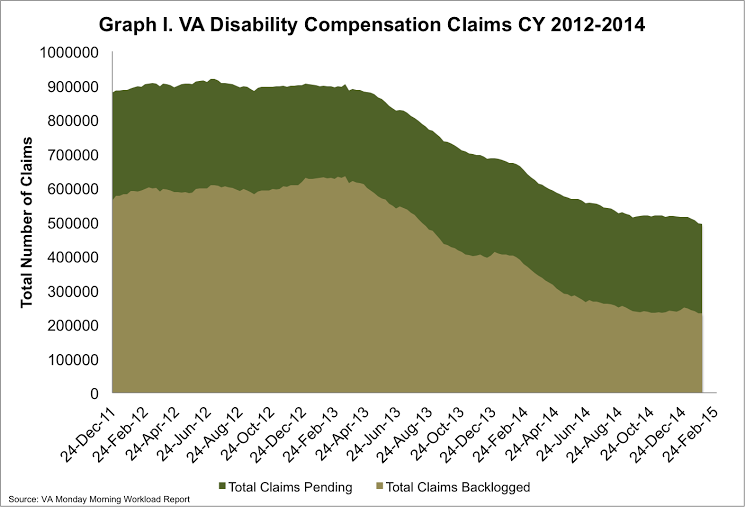 Since March 2013, when the backlog hit its peak, the VA has decreased the overall backlog nearly 65%. At the same time. 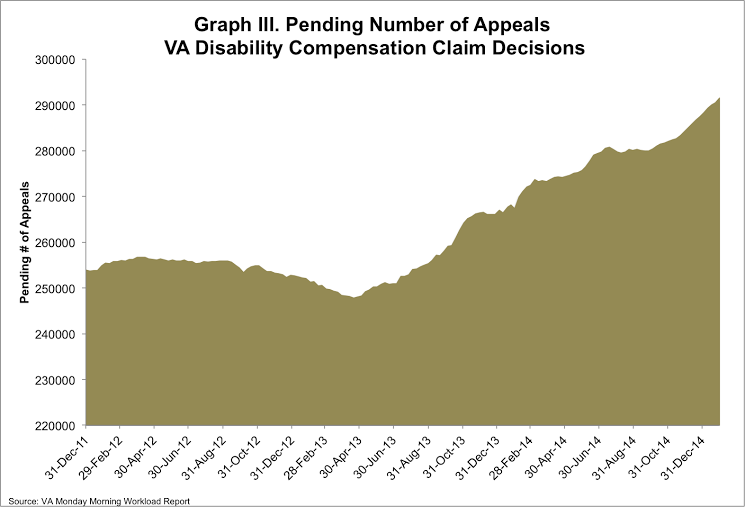 the VA reported an increase of over 1000 appeals pending, raising the number to a total of over 293,000 appeals pending decision. Last week this post focused on the VA’s renewed commitment to end the VA disability backlog by the end of CY 2015. As part of the commitment made in 2013, then-Secretary Shinseki committed not only to an end to the backlog, but also an increase in the claims accuracy rating to 98%. At the time, the rate was hovering at around 86 percent. Currently the claims accuracy rating is holding around 91 percent. But what does that mean? 10 rating cases processed under the Integrated Disability Evaluation System (IDES) program at Providence and Seattle. Translated, this means about 14,000 entitlement rating cases are reviewed through the STAR program annually. From those reviews, the reported accuracy ratings are calculated. Both of these ratings are important measure important endpoint and provide valuable feedback. The claims based accuracy rating gives a bigger picture of the total claim, and how the process is working from start to finish. It captures errors that might go beyond a specific medical issue, to include administrative errors in processing that claim. The accuracy rating by issue gives more information on errors specific to medical issues. 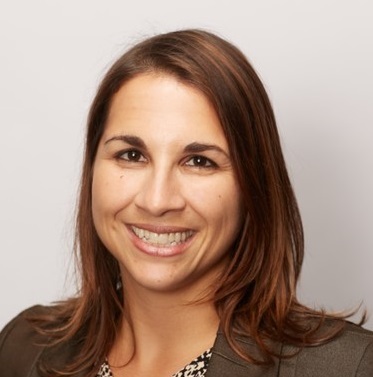 Behind the scenes, that kind of information can help inform how the VA addresses training for their claims processors and can be very helpful in identifying specific medical areas that need support. So both of these measures are important for both the VA in identifying areas that need further training, and for the public, to understand where challenges remain in the adjudication process. However, there has been some discussion as to whether the VA accuracy ratings truly represent the accuracy by which claims are adjudicated. And this comes from considering other sources that are also assessing claims adjudication independent of the VA. The VA Office of Inspector General conducts an audit of each Regional Office independent of the VBA quality control program on a three year cycle. Results from these audits really help to identify to identify challenges that are local to each Regional Office, and provide recommendations to address these challenges. You can find a summary of some of these reports in the VAOIG’s semi-annual reports to Congress. The Veteran Service Organizations that help vets submit disability compensation claims keep their own records on accuracy, and at times (although not recently) have been outspoken in the VA numbers are higher than they are seeing. So at the end of the day, there are a number of ways in which the VA and outside organizations are tracking the accuracy by which these claims are processed and each of these methods give really important information as to how the system is working. The challenge at the end of the day is putting a number that we can all agree upon to convey the accuracy level. What’s probably more important is that this is all good data to use for accountability. All of this should help the VA to continuously and comprehensively assess the disability compensation benefit program and as a result to continually improve processes as weaknesses are identified. 1) Taken from the Department of Veterans Affairs 2014 Performance and Accountability Report. 2) Note that the accuracy rating is reported weekly as both a 3-month average and a 12-month average, and both numbers are hovering around 91%. 3) The VA began reporting this in October 2013.